On 15th December 2016, Perbanas Institute held its most recent graduation ceremony for the upcoming generation of prominent bankers at the Jakarta Convention Centre. The globally-minded graduates comprised of Perbanas' undergraduate, postgraduate, and diploma programmes. Perbanas Institute espoused the theme of “Accelerating Financial and Banking Inclusion and Its Impact to Macroeconomy and Global Business” in keeping with the Financial Services Authority’s national agenda. A number of esteemed guests attended the event including Rector of Perbanas Institute Prof. Dr. Ir. Marsudi Wahyu Kisworo, Chairman of Perbanas Education Foundation Daily Committee Mr Eka Noor Asmara as well as Mr Budhy Hery Pancasilawan, S.H., M.M. as a representative from Indonesia’s Higher Education Coordinating Board Region III. During the ceremony, Mr Budhy Hery Pancasilawan praised Perbanas Institute for its latest award as the ‘Best Private Institution in Jakarta’ which demonstrated the institute’s upper-hand in Indonesia’s competitive higher education sector. 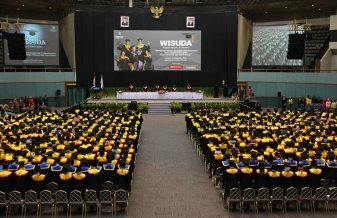 Furthermore, Board of Commissioner Member at Indonesia’s Financial Services Authority, Dr. Firdaus Jaelani, MA provided a keynote speech in which he expressed his expectations for Perbanas Institute’s new 902 graduates in bringing about concrete change to the country’s finance and banking industry. Perbanas Institute’s key strengths in education and research continue to propel its industry position as a renowned private education institution in Indonesia. With an unwavering commitment to producing skilled banking professionals, Perbanas Institute’s newly-graduated students are hoped to become the change-makers that are needed to move Indonesia’s finance and banking industry forward in the coming years.